I wrote two article about the Marche region of Italy last July to help my friends Piero and Katherine promote their business, Vita Verde Imports. They were planning a fall 2014 guided wine, food and truffle tour of Marche and although I was not able to attend it looked fantastic and I know their group had a blast! 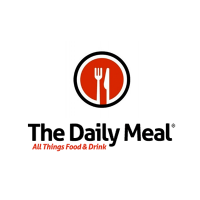 Fast forward to April 2015, my life overflows with blessings but those blessings have cramped by schedule and I did not have time to visit my favorite Italian grocer and wine store (Jimmy’s), which is where I source my wine for #ItalianFWT or research and prepare a Marche influenced meal. As luck would have it Jimmy’s even hosted a Marche wine dinner on April 29 and I was unable to attend. Therefore, I am editing and re-purposing the two article I wrote last July into one article featuring the delicious wines I enjoyed last summer from Marche as well as some photo highlights from this hidden gem! Terracruda Pergola Rosso 2011 The Best Unknown: I had never smelled a wine with such a unique and pleasing bouquet as this red wine. It poured soft garnet into the glass and enveloped the nose with an inviting array of rose petals, red cherries, strawberries and dried herbs. The aroma was fresh and full but not sweet, very pleasing. The palate was quite interesting because, though it was quite good, it did not necessarily follow the smell. Lost was the strong floral bouquet; instead it came forth with cherries, soft vanilla, toasted hazelnuts and beautiful minerality. It was medium dry with a full mouth coating of well balanced acidity. I really liked this wine! The Pergola Rosso was 100% Vernaccia de Pergola (Aleatico), which was a descendent of the Muscat grape. This wine is a compilation of grapes from several vineyards within the villages in Le Marche. The yields were restricted to just over 2 tons per acre and all the grapes were handpicked to minimize bruising. After destemming, the must was fermented in temperature-controlled stainless steel. The Pergola Rosso DOC was made to be consumed young and fresh; therefore, it only rested 6 months in glass, before being released. SRP $13.50; a great value for an easy drinking wine that is light and refreshing that is perfect for the summer heat. Terracrude Vettina 2011 Pergola Rosso: This wine offered a similar bouquet to the previous wine because like The Best Unknown, this wine was also made from 100% Vernaccia de Pergola (Aleatico); therefore, it offers the similar floral and fresh red fruit bouquet of the Muscat grape. However, this was a single vineyard Pergola Rosso, which Piero wanted us to try so we could taste the subtle differences. Those differences were there; this wine offered a deeper ruby color and followed on the palate with more of an earthy terrior along with hints of chocolate and tobacco. It was still a light and refreshing wine and was equally enjoyable to drink. 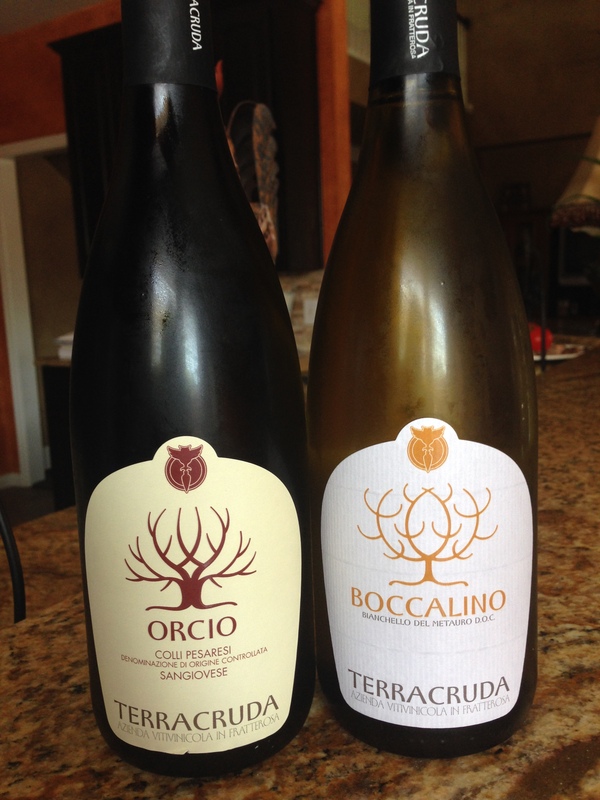 This wine was produced in Pesaro E Urbino in Marque, Italy in clay soil that was rich in sand. 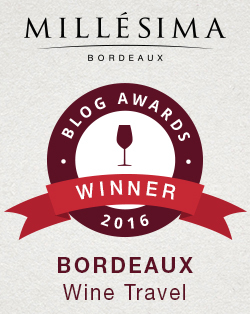 The grapes received prolonged maceration for more than 20 days and were fermented in stainless steel before aged for at least a year in French barriques barrels. It contained 13% alcohol and the SRP is $14.00. 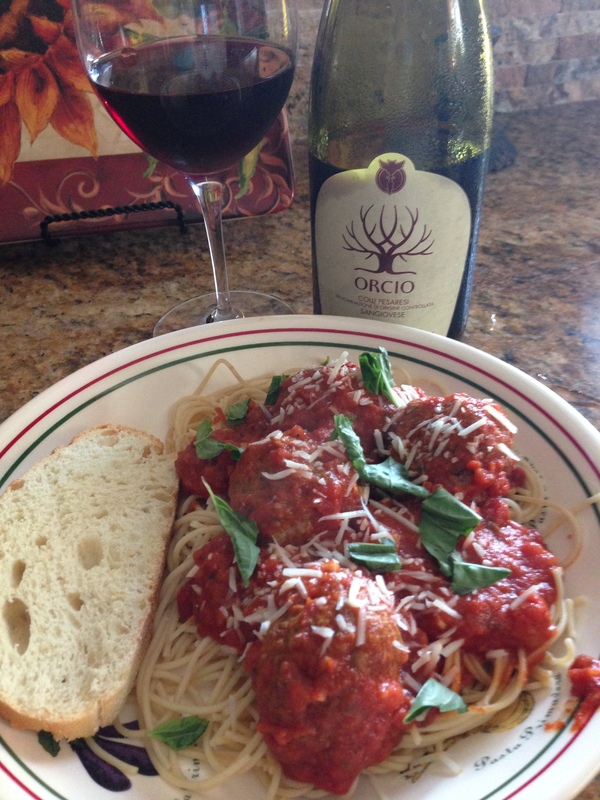 Pair each of these wines with pizza, spaghetti with meatballs or Bolognese, lasagna, or angel hair pasta with fresh tomatoes, basil and Italian sausage. YUM! Terracruda BoccalinoBianchello Del Metauro: This soft golden white wine was made of Bianchello grapes in Fratterosa Pesaro E Urbino area of Le Marche. It opened with delightful citurs and floral aromas. On the palate it delivered flavors of lemon curd, and lime with marzipan and elder flowers. It was slightly tart with a lovely dryness, medium body, and medium acidity that paired very well with food. At 12.5% alcohol it was balanced and fresh. 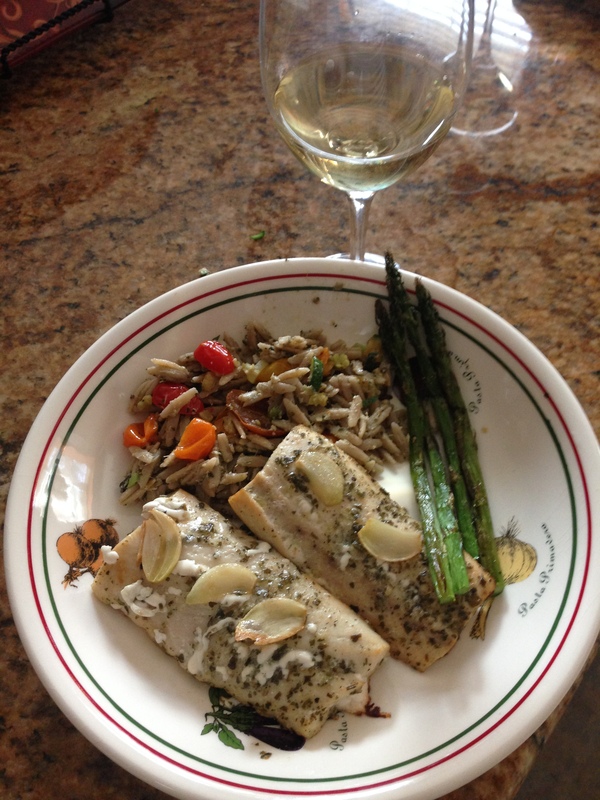 I paired this wine with oven roasted mahi mahi accompanied by orzo pasta with roasted vegetables and asparagus. I also paired it with sausage, rosemary and grape pizza. Delicious! The wine is crisp and refreshing so it was an excellent accompaniment to these two dishes. Terracruda Orcio Colli Pesaresi: This vibrant ruby wine was made of 100% Sangiovese grapes and was also grown in the Fratterosa Pesaro E Urbino region of Le Marche. On the nose this wine delivered aromas of spice and floral scents, followed by an earthiness with a touch of leather. On the palate this lovely Sangiovese tasted of soft cherries, fresh strawberries, with soft baking spices, and a lingering minerality. It was light to medium body, with a lovely dryness, light tannins and well balanced acidity. The alcohol percentage was 13.3% so it was a lovely addition to food without overpower a meal. I paired it with traditional spaghetti with fresh tomato sauce, fresh basil, meatballs and grated parmesan cheese as well as sausage, mozzarella and roasted red pepper pizza. 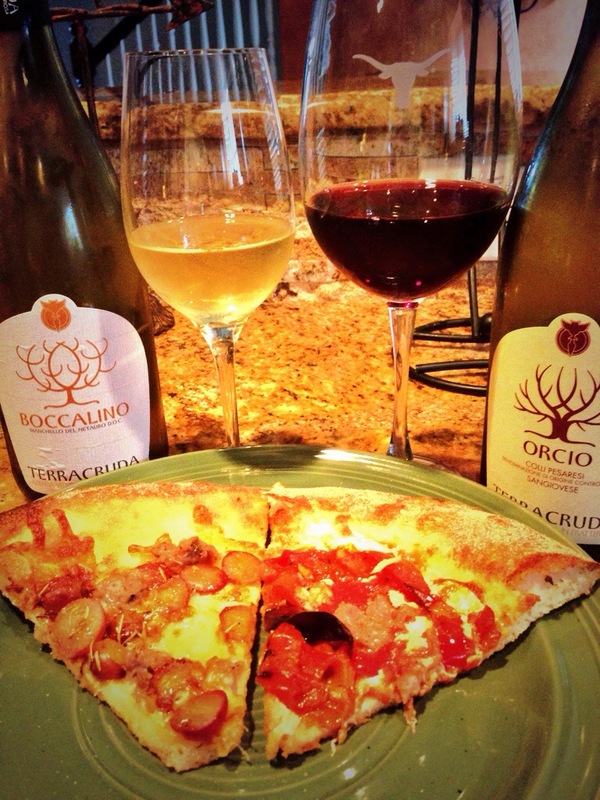 This lovely Italian wine was a delightful pairing to these two Italian dishes. Terracruda Sweet Tempation: We ended our meal with a bottle of Sweet Tempation. This wine was a blend of Terracruda’s Pergola Rosso wine with a particular variety of wild cherries called “Visciole”. In July, when the cherries are mature, they are picked and mixed together with wine and sugar to obtain a second temperature controlled fermentation. 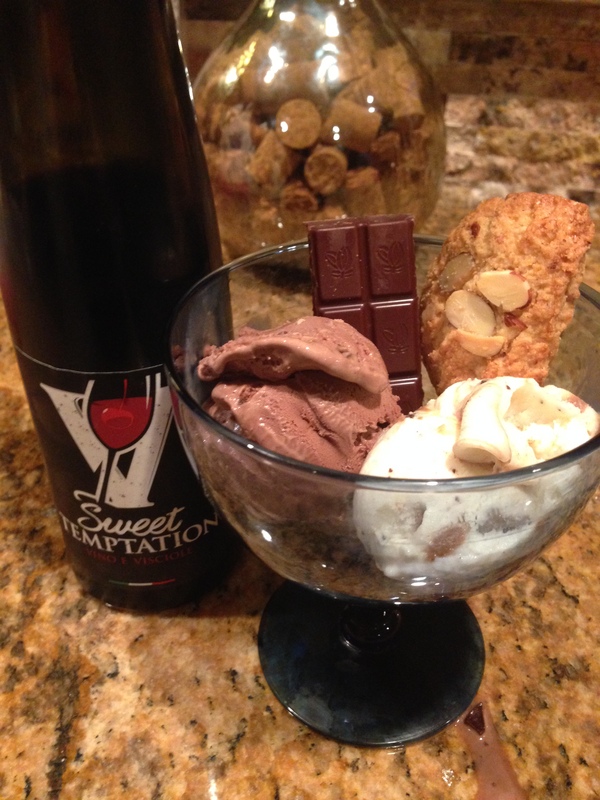 The result was a sweet, delicate, particularly aromatic wine that marries well with desserts and chocolate based sweets. The syrupy garnet wine was delicious! It was sweet and thick and tasted and smelled of dark rich cherries and dark chocolate with a hint of vanilla and toasted almonds. It paired Great with our Italian Gelato, almond biscotti and dark chocolate. We were living the life of Italians in Le Marche! 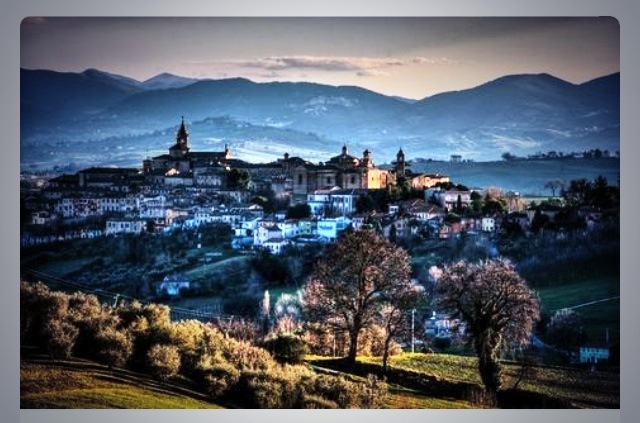 If you like beaches, mountains, skiing, spas, wine, food, truffles, monuments, churches, ancient villages, art, shopping and spirituality than Marche has something for you! 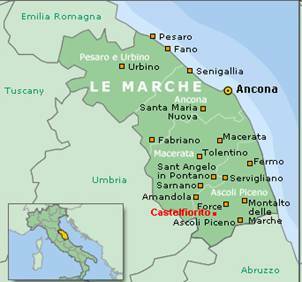 Please check out the user friendly, information packed Visit Marche web site for all the great things Marche has to offer and follow #DestinazioneMarche on Twitter to learn more about Marche Exp 2015. Please take a look at what my fellow #ItalianFWT writers have discovered about Marche and join us live on Twitter today at 10am EST and throughout the weekend at #ItalianFWT and share your experiences of the Marche region in Italy. Join us next month for #ItalianFWT on Saturday June 6th as we explore the Campania region in Italy. If you would like to join our group email Vino Travels directly: vinotravels@hotmail.com. My Song Selection: One of the many things Marche is known for is the annual Ancona Jazz Festival. Additionally, two days ago (April 30) was International Jazz Day 2015! Therefore, the song I have chosen to pair with this article on Marche is Expectations by Albare. The video features Albare’s 2014 live performance at the Ancona Jazz Festival. 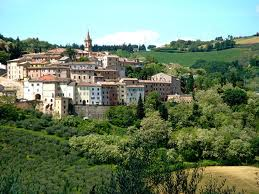 This mellow jazz song well represents the laid back, easy going, nature driven life-style of Marche, and it sporadically shows images of the beautiful town on Ancona in Marche so grab a glass of Marche wine and sit back, relax and watch this beautiful video. Get your own bottle of Marche wine and let me know what song you would pair with it. Cheers! I didn’t know about the Jazz Festival there. Seems it was good timing this post for International Jazz Day. A Marche wine dinner, too bad you couldn’t attend, but nice display of the other wines of this region including Aleatico. Thank you. I think the Jazz Fest sounds fun too! I think Le Marche is one of those hidden spots that just beg exploration. 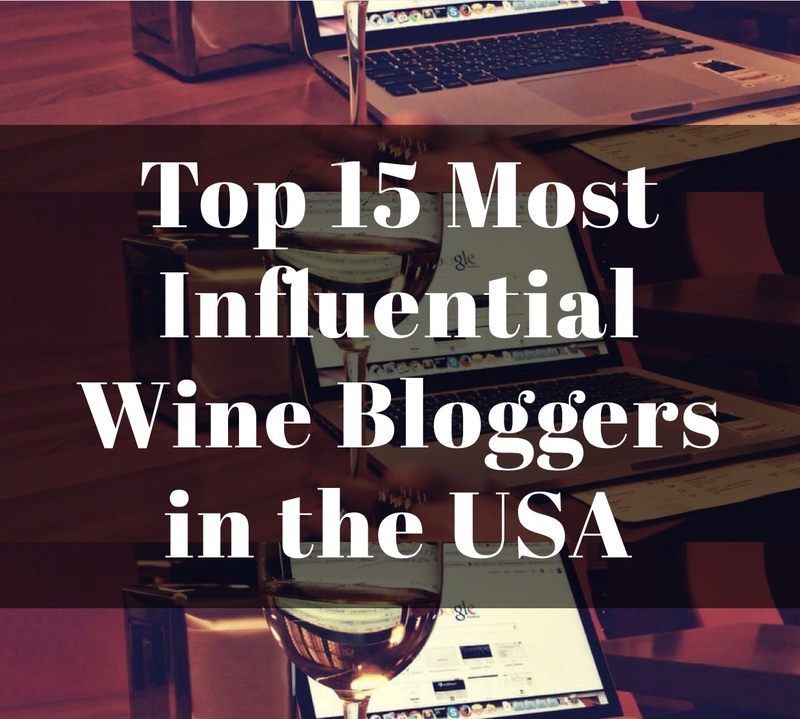 Thanks for sharing those wines, I had never heard of any of them! You are welcome. 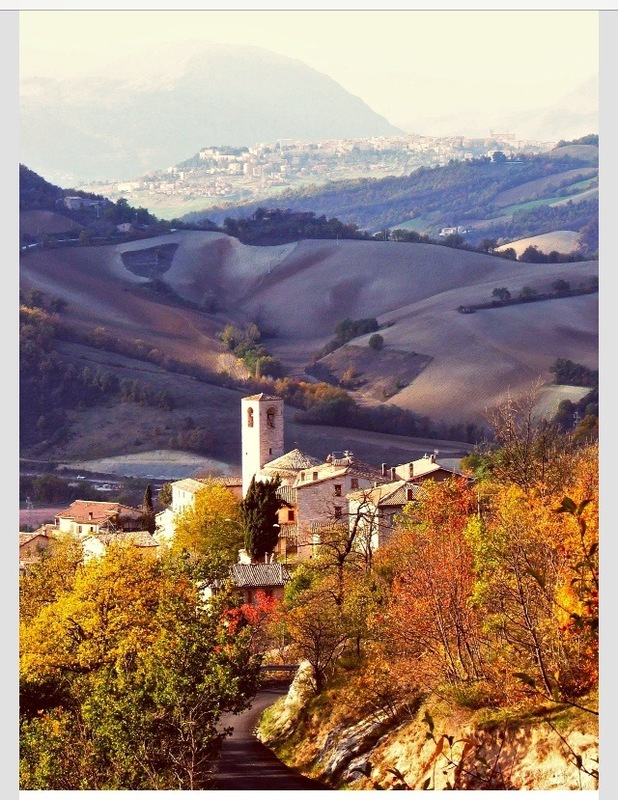 I would love a fall tour of food wine and truffles in Marche! 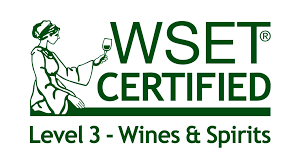 So educational – I will have to look for those wines. Wish I had a resource like Jimmy’s in the desert. Great food, wine and music pairing! Jimmy’s is awesome but it sounds like you did pretty well at Total Wine! There is nothing wrong at all with editing and repurposing a blog post, I do it all the time! Wonderful information about the Le Marche region, thanks! Love Le Marche. It’s such a fantastic region and one of Italy’s last “hidden gems” when it comes to wine. But also culinary wise Marche is a wonderful place. I’ve been lucky enough to travel through the region on a few occasions. Friendly people, amazing wines and delicious food. Cheers! 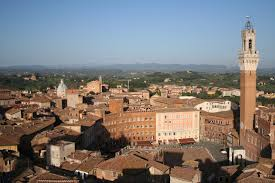 I look forward to the day I get to travel to Marche! Thank you! I hope you’ll get to go some day. It is beautiful, and the beaches help it, too. I think of it as the Tuscany that most look for (because it is still rather calm and quaint, nothing one could possibly say about Tuscany…which I love, too, don’t get me wrong!). I hope so too. Thank you Oliver.